I just realized that we haven’t talked at all about the Detroit Urban Craft Fair on this blog. Whoops! DUCF is our big project this year. Visioned as Michigan’s answer to great alternative craft fairs like Renegade and Crafty Bastards, Handmade Detroit will present the fair on August 5 @ the Majestic in Detroit. We have a real Web site planned for arrival in April with all the knitty gritty (including still-being-decided info for vendors). Bookmark www.detroiturbancraftfair.com and watch this space for the site to go live. In the meantime, we’ve started a little fundraising to cover the costs* of hosting a fair this large. You can now support the DIY community in Detroit by purchasing our Handmade Detroit icon in pin form. (See that photo? That’s what they look like!) The pins are available right now at Lost and Found Vintage in Royal Oak. They are also available Saturdays (including tomorrow) at Rock’N’Rummage from 11-4 at Xhedos in Ferndale and Wednesday nights from 6-close during Baar Bazaar at the Garden Bowl in Detroit. And very soon we will have them available online in some way. * Venue rental, advertising, printing costs, web hosting, etc. 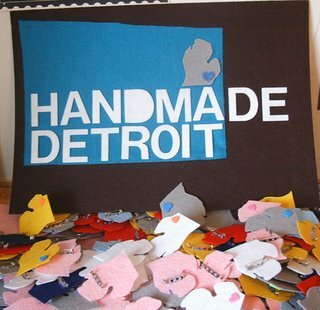 + Handmade Detroit will be at the Exhibitionist opening March 29th at The Belmont. Come say hi, eat some free food and check out the work of Anastasia Feofanora. And thanks to Annie for always thinking of us!